Does your lawn need a boost, or do you have a problem with weeds or moss? There’s a variety of products to keep your lawn in tip-top condition, and Which? has put 35 lawn-care products to the test. 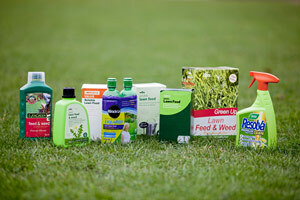 We reveal our Best Buy lawn feed, feeds and weeds, and weed, feed and mosskillers and spot weeders. We have reviewed own-brand products from Tesco, Wilko, B&Q and Homebase, plus brands such as Miracle-Gro, Evergreen, Westland, Bayer and Vitax. Head to our lawn care products review to find out which products are our Best Buys. We tested 18 lawn feeds on an area of neglected turf, representing a typical family back lawn. The 11 feeds and weeds were tested on an area of typical lawn infested by a selection of common lawn weeds, including buttercups, dandelions, daisies, clover, plantains, speedwell and self-heal, covering almost half of the surface. We tested the seven products containing a mosskiller on an area of lawn containing 45% moss. The five spot weeders were tested on the weedy lawn; individual weeds or patches of weeds were sprayed by hand. We would definitely recommend using a lawn feed – the untreated control plots deteriorated during the trial. There were big differences between the best and worst, though, so it’s important to choose the right product. When a lawn is in poor condition and contains as many weeds as grass, a one-off weed-and-feed treatment can help. In our trial, the best feeds and weeds reduced the weeds completely and gave the grass a boost, leaving a much better lawn at the end of the season. If your lawn is full of moss, too, we found that a combined weed, feed and moss treatment will deal with both problems and improve the grass. If your lawn is spoiled by just a few patches of weeds, blitzing the whole lot with a weed and feed might not be necessary. Don’t overlook hand weeding – larger rosette weeds, such as dandelions and daisies, can by prized out with an old knife or a special weeding tool. For scattered patches of weeds, a one-off treatment with a Best Buy spot weeder will work wonders.